CeeLo Green and Christina Aguilera will return this fall, with Shakira and Usher back for season 6. It's official: The Voice is bringing back its original lineup of coaches for season five. It was announced Friday that Adam Levine and Blake Shelton, who have been on the NBC singing competition since its inception, will be reunited in the red chairs with Christina Aguilera and CeeLo Green when The Voice returns in the fall. Shakira and Usher, who replaced Aguilera and Green for the current fourth season, will be back for the sixth cycle, which is slated for a midseason launch following the 2014 Winter Olympics. Levine and Shelton will remain as coaches. NBC plans on using its Winter Olympics coverage from Sochi, Russia, as another platform to tout the sixth season. Carson Daly, who also leads late-night talker Last Call, will continue as host. "We locked in a plan several months ago to have the outstanding Christina Aguilera and CeeLo Green rejoin Blake and Adam for cycle five, and we're pleased to announce that the original four coaches are going to be back together in the fall," said Paul Telegdy, president of alternative and late night programming at NBC. "They're the reason this show was launched so strong for the first three cycles, and we owe them a debt of gratitude. And after careful consideration of everyone's schedules for next spring, we are excited to be returning to the current cycle of judges -- Shakira and Usher along with Blake and Adam -- for cycle six, which will premiere after the Winter Olympics." The current season of The Voice averages 14.5 million total viewers and a 5.2 rating among the ad-coveted adults 18 to 49 demo on Monday nights. 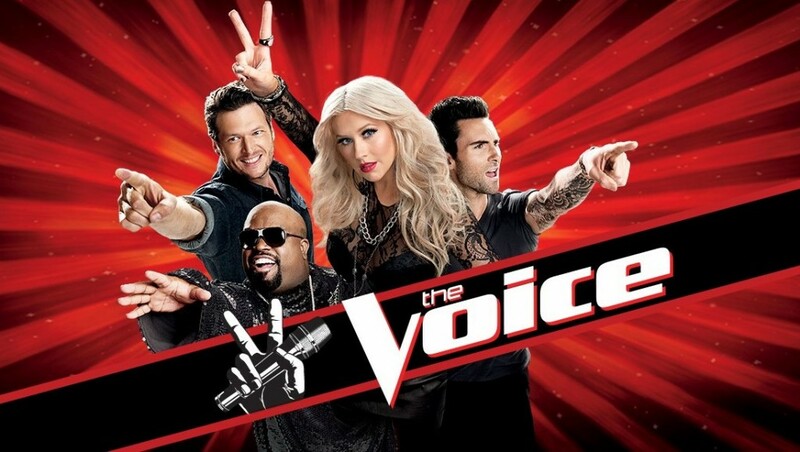 For the Tuesday edition, The Voice draws 13.4 million viewers and a 4.7 rating. The Voice has proven to be an invaluable boost to the coaches' careers. Levine recently inked a one-year first-look deal with NBC and has used his exposure on the show to land several acting gigs (American Horror Story: Asylum; Saturday Night Live; upcoming film Can a Song Save Your Life?) and boost Maroon 5's stature (the band will headline the Honda Civic Tour). Meanwhile, Green -- who inked a deal with NBC last fall -- is headed to TBS with a new docuseries launching next year. The news comes as Fox's American Idol wrapped up its 12th season with its least-watched and lowest-rated finale to date, with another change at the judges' table (Idol veteran Randy Jackson will not return) likely coming. The Voice wraps up season four June 18.